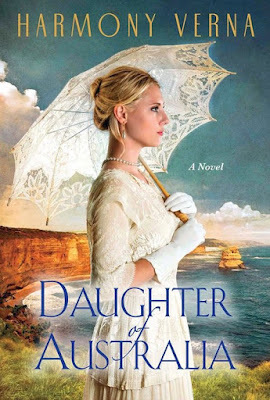 Daughter of Australia (Kensington Books, 2016) by Harmony Verna is a historical novel touching on three continents and spanning 20 years. It tells a deeply personal story of Leonora’s struggle to find a life for herself amid war, abuse and secrecy. I contacted Harmony Verna and asked her to discuss her writing process. WOW: First, what inspired this story? Harmony: For as long as I can remember, I've had an obsession with Australia...the people, the landscape, the history. As a child, I had a huge map of Australia hanging over my bed and would stare at the continent, the names of rivers and towns, with such longing. I remember being so drawn to a tiny spot on that map named Leonora. I even put a thumb tack through the word. I believe that was really where the first inspiration for Daughter of Australia came about. The wild part is that I was only about eight-years-old at the time. The start of the novel came through channeling a reverence for this land. I knew the main characters would be James and Leonora but I wasn't quite sure how they would take shape. I began writing about the scenery, pulling myself so deeply into the land that the characters began to form around the landscape like trees sprouting from the earth. After that, the first scene came very quickly and the story evolved around that first traumatic event of a child being abandoned in the harsh Australian outback. WOW: With the plot, subplots and numerous characters, how did you keep track of the details? Harmony: This was extremely challenging. I had several notebooks stuffed with information, research and facts. I wanted to use it all! But, I had to be very discerning in what to include, otherwise the story would have been overshadowed with historical data. Weaving all the characters into a historical timeline, especially ones on opposite sides of the globe, took a great deal of organization. For instance, Australia entered WWI in 1914 while America entered in 1917. On top of that, Australia's seasons are reversed so I had to take into account weather differences as well. There were many days that I sat amidst piles of crumbled balls of paper with my head buried in my hands. I laugh about it now, but at the time, it was very difficult. As I went through the story, I just continued to outline, outline, outline until all the scenes fell into place, not unlike a puzzle. WOW: How did you create realistic dialogue for characters from various continents and economic levels? Harmony: What helped me the most was reading poetry. I would read works by Australian poets such as Henry Lawson and replay the sentences in my mind over and over again. Pretty soon my characters took on the cadence, and the dialogue really began to flow. Anytime I had to convey an accent, be it Irish, Australian or American, I went to poetry for assistance. WOW: How much did your novel change from the initial idea to the finished product? Harmony: Originally, I thought the entire novel would center on Leonora. I began writing the story from her first person perspective, but then as the other characters came to life, I wanted their insights and perceptions to share the stage. The biggest plot change had to do with Ghan, who, by the way, is my very favorite character in the novel. I had always envisioned Ghan, this hard and burly miner, finding Leonora and then disappearing from the novel...his purpose done. But I could not get this character out of my mind. He was the perfect blend of hard and soft and I became deeply attached to his story. Whenever I was at a loss in the novel as to where to go next (which happened a lot! ), I brought Ghan in and he guided me home. WOW: What words of inspiration do you have for our readers who may be trying to complete their first novel manuscript? Harmony: First of all, you have my undying love and support! Writing is difficult. Sometimes it flows and everything comes out roses and butterflies; but then you have those days where you feel like you are trudging through manure. But don't give up. Never, ever give up. If you have a story in your soul, let it fly. I found that the hardest part of writing a novel was quieting that little voice in the head that was telling me all the reasons why I wasn't going to become a writer. Luckily, I had another voice inside my gut and my soul that told me, I COULD do this. In fact, the words were, "Just write. It will come." So, I will share those words with you, dear writer..."Just write. It will come." You can do this. You wouldn't be reading these words if you weren't drawn to creating your own story. Trust yourself. Trust your worth. Trust your talent. Don't worry about writing something great, just write. And as you do, the great will emerge. SueBE here: A special thank you to Harmony for sharing her book, her talents and her insights with The Muffin’s readers! For more about Harmony and Daughter of Australia, be sure to check out the bio page and book page on her web site. A hint – take the time to look around and you will discover samples of her writing.